Here is today's picture of the yard. It's been hot lately. My twin 5-frame nucs like to beard as a group. Interesting thing I discovered today and have never seen before. See if you can spot it. If you said bubbly nectar, you win! I've never seen this before. By the odor wafting from the hives, I'd say it's fermenting nectar. So what's the cause? If I were to make a guess, I'd think about the following things. First, what flowers are blooming right now? Are their nectars troublesome? The main things I can see blooming at this time are chicory and clover, neither of which have I ever heard of this problem. Second, are the bees unable to cure the honey for some reason? This is a possibility based on a few factors. First, high humidity would make it difficult to cure honey. Second, poor ventilation might cause the same problem. All the hives I noticed this problem in today were ones that have a single 1.5" circular entrance. The problem was more pronounced in 5-frame nucs, but also seen in single deep hives as well. It was not seen in hives with more than one entrance or those with a wide bottom entrance. 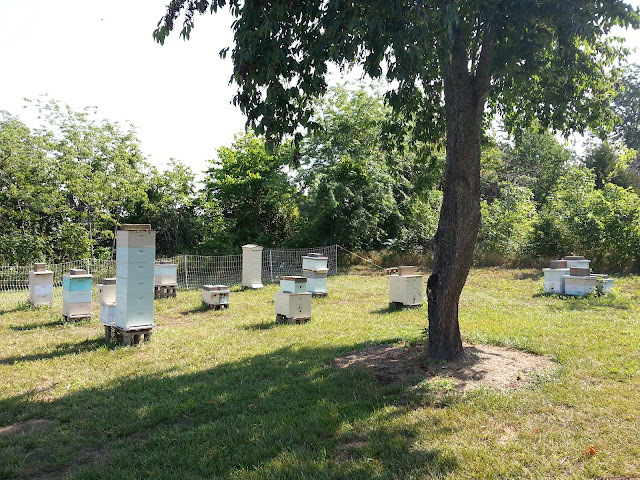 In fact, in the picture above with the bearding bees, those are the hives where these frames were found. They were not bearding this morning however. I don't have a solid answer, but I think the second scenario is more likely, that poor ventilation is causing problems curing the honey, exacerbated by high humidity here in Arkansas. Harvested honey this past week, 17 gallons. Here's a pic of the yard. You can see the tan colored cube hives in the front middle. The one on the right is fully decked out and the one next to it is just getting going. Here's the latest picture of the home yard. There's been a lot going on and not enough time to write about it and a deficit of pictures to explain. But here's one that should explain a little. These are the queen cells taken from my queenless starter/finisher. As you can see, 11 of 18 made the cut. In the queenright starter/finisher, 17 of 18 made it through. I've decided to use the queenright method from now on. It's much easier, very simple, and you don't have any of the downsides related specifically to queenless methods. This small sample size also shows how well it can work for a first timer compared to queenless, however, don't trust just two tests. After the cells were matured, I got out on a Tuesday morning a few weeks ago and robbed seven hives of all but one frame of brood to have enough brood to make up the mating nucs. The mating nucs are 3x3 queen castles that I designed and built myself. In each, I placed an empty drawn comb, a comb of honey, and a frame of brood with adhering bees. You can see in the picture at the top of the page most of them. Three are in other places around the property. 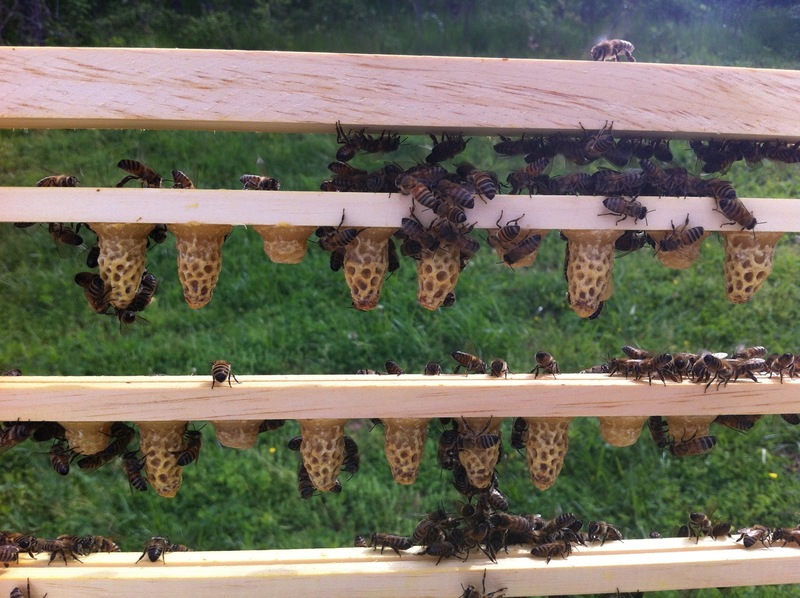 After the queens hatched, I removed the queen cells and cell protectors. The JZBZ cell protectors don't fit over the cell, but they still can protect and be used as a way to attach the cell to the comb. After checking them a couple times, I can safely say that the vast majority have mated and returned healthy. I have found one where the queen didn't return and one where the queen has not begun laying. Out of 28 cells, those are pretty good numbers. 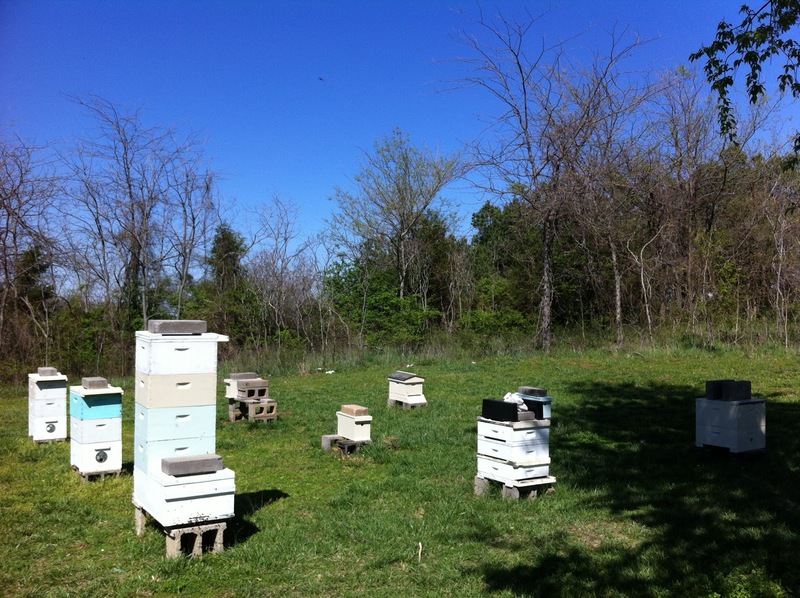 The nucs are all brooding and the first weekend in May, I will begin culling, combining, and figuring out where they will all be going. 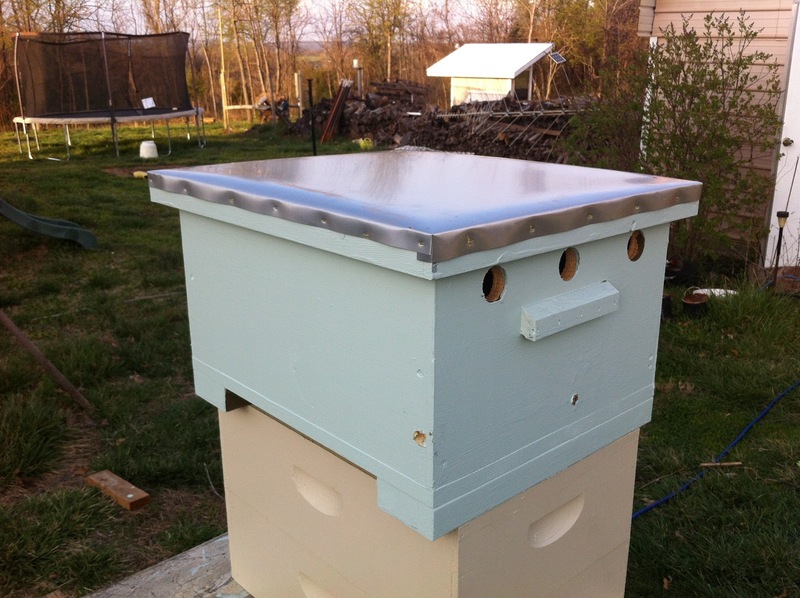 My goal is to go into winter with at least 25 hives and the extras will be sold as nucs. So, not too long and there will be nucs for sale. I had a somewhat exciting week, this past week, Spring Break. I grafted for the first, second, and third times. 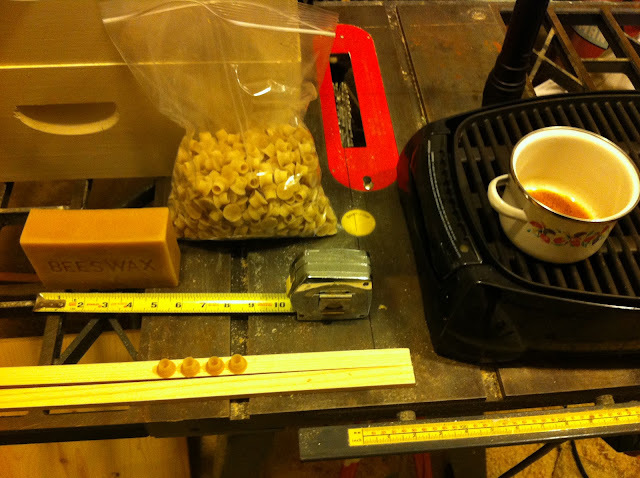 Sunday night, I made up some cell bars using wax cell cups I purchased from Rossman. Monday morning, I put them in the hive so the bees could get used to them. I put 12 cups on at first. On Tuesday, there seemed like there was going to be a break in the rain after it had rained for two days. During an actual break in the rain, I ran out to my chosen hive and did the manipulations for the Ben Harden Method, acquired the frame to be grafted from, grafted, and placed the cell bar frame back in the hive. I added six more cups just for fun. 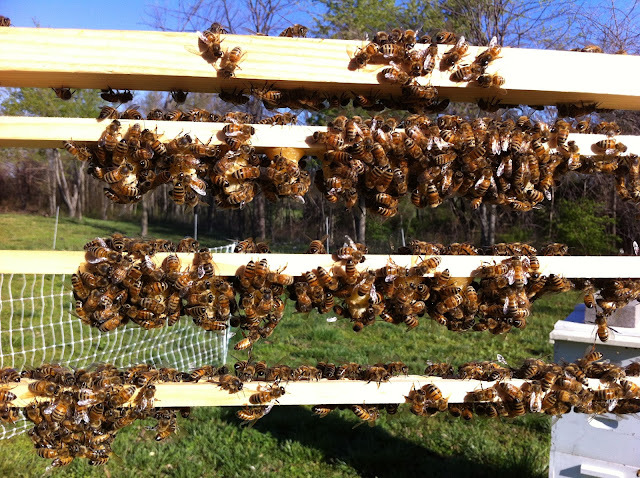 The Ben Harden method is one in which you use a queenright colony to raise new queens. To do this, you make two dummies, frames that are just solid wood which kind of concentration the action in the hive to just a few frames in the middle. You put this setup above a queen excluder. You then place a frame of pollen, a frame of young brood, and the cell bar frame in the box and nurse bees are supposed to come up from below and care for the new queens. They are not supposed to reject them because the queen has never set foot on that cell bar frame and thus her scent is not there. It's managed kind of like an engineered supersedure. Later in the week, I checked. Every single one had failed. No takers. I had a few ideas why, the rain was on the top of the list. I should have had more patience. Instead of nurse bees coming up to tend the brood, they stayed in the main brood nest as it was probably too cold to go meandering about the hive. Fortunately though, I had placed an empty comb in the broodnest to replace the one I put in the upper box. But I'll get back to that later. So I left the cell bar frame in the hive and waited until Saturday when the weather should be excellent. 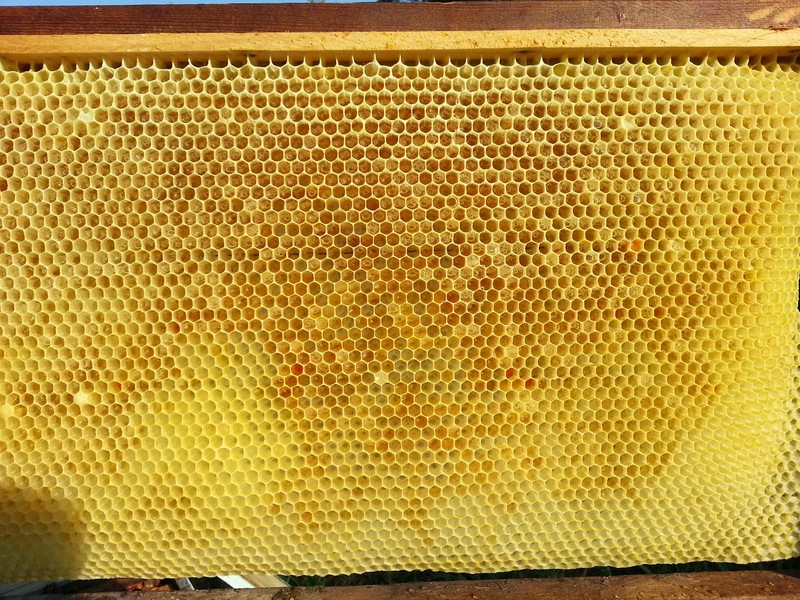 I made up some more cell bars, another frame with 18 and decided that I would retry the Harden Method and also do a batch with a regular queenless hive. That frame that I had put in on Tuesday was now the perfect frame to graft from and to use to bait nurses up from below. All the larvae were pretty uniformly on their first day out of the egg (some eggs remaining) and were the perfect age to be grafted. Add to that the fact that the cups had been in the hive for half a week and were well polished and ready to go. It's hard to tell in this picture, but the bees have begun to raise 17 out of the 18 grafted larvae. Quite a good run. Remember, this is in a queenright hive which can go about its business with no disruption in brood rearing or queenlessness. I took pictures of the queenless hive cell bar this morning as well, but my phone focused on the grass in the background rather than the bees so the picture is out of focus. But it looks almost the same except that they only took 12 of the 18 grafted. I reason this is at least partly because the cells were not allowed to be polished by the bees before grafting. You can be assured I will not make that mistake again. Overall, this was a very successful excercise and one from which I learned greatly. More updates soon. In a week, it will be time to make up mating nucs and that is likely to be a monumental task. As you can see in the picture at the top, the yard looks markedly different. I've removed most of the real estate from the hives that are not doing what they should be doing at this time of the year. 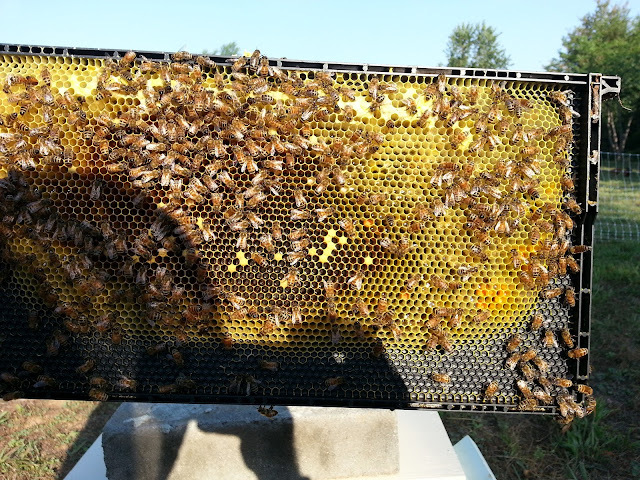 The middle hive in the left row is the one wherein the Harden Method is being used, and the very back corner one is the queenless one. 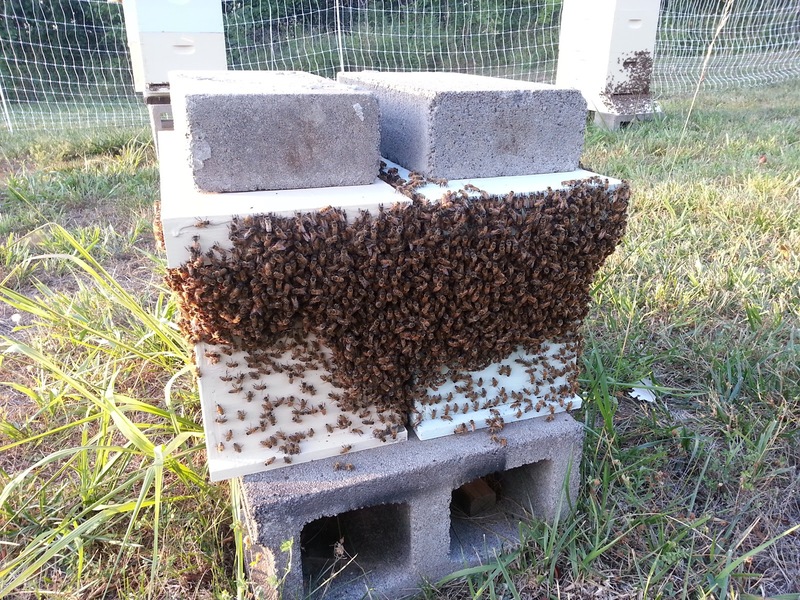 Its queen is in the nuc behind the bricks to the left of it. All the honey stored from last year in the puner hives is being stored on the big nasty hive in the front. This year, it is the designated honey producer. It is a very active and healthy hive, but a little too mean to breed from. Such a shame. 29 mating nucs is going to be a marathon! Here is a picture of the bottom board of a hive I took apart on Saturday. If you right click and select 'View Image' you may be able to see the number of mites there are on this bottom board. There are tons, hundreds, maybe as many as a thousand. 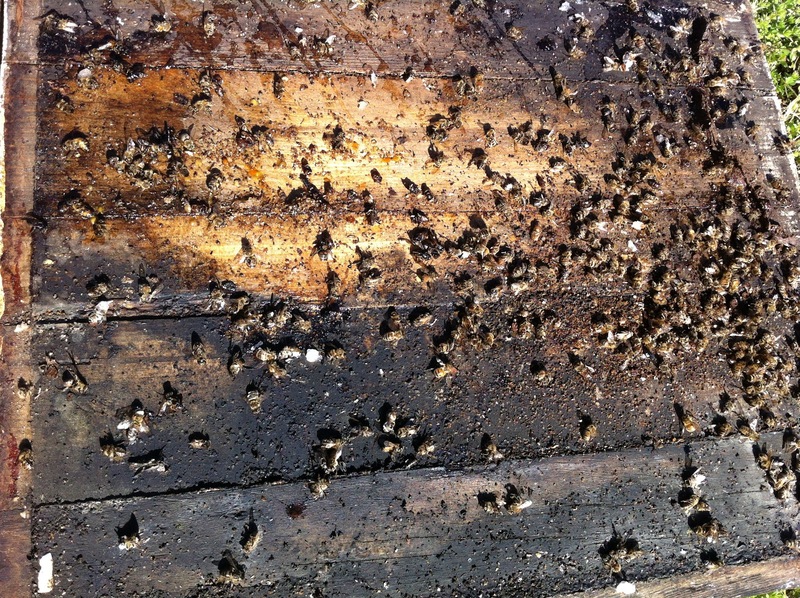 This is what I would expect to see on a bottom board from a hive that had died from varroa mites. But this hive not dead. This is the hive that I expected to die last fall due to an extremely high mite load. I remember inspecting this hive and seeing mites everywhere. I saw them crawling on bees, in cells with brood, crawling across the comb, everywhere. There were hundreds. I expected this hive to die. But it didn't. Remember, this is a completely treatment free hive. No treatments ever. And yet it survives, even with a massive mite load. Admittedly, it's not doing great, but we shall see what happens. This is one of the reasons I let hives die on their own, to see exactly how much they can take and if they have what it takes to survive. The Double Queen Hive Returns! Latest picture of the home yard: like five minutes ago. As you can see, I got the 8-frame hive in today. And the double wide is a double double. I guess I missed a queen cell when I was in the hive a few days back. They seem intent on superseding this queen for a third time. The first one I took and put in a hive that was queenless last year. The second one is now in a hive of her own. I think I'm pushing my luck if I don't let this one be. Plus it's obvious the old queen is not a high performer by herself. In fact, due to the timing, this new virgin may actually be her granddaughter. She's certainly different colored, more like the locals than the original or her daughter. It may be an interesting trait of this hive though that the old queen is not disposed of even when it's obvious that she's not pulling her weight and I wonder why that is. I wonder if her daughter or granddaughter will keep it. I don't think the old queen is laying many eggs at all though she's not yet a drone layer. Tell me what you think. Sorry, I don't have a 'what the yard likes like' pic, I keep forgetting lately. I've been working on expanding my egg operation to two dozen a day. Actually, you'd probably be able to see the edge of the chicken yard in such a pic. I have a movable poultry net fence. It allows the chickens to eat more bugs and less feed, which is good. But on to the topic du jour, the Parker Cube Hive. Here, you can see the basic form of the hive. It is intended to be all mediums as a 14 frame medium is about the same comb area as a deep. A 12 (regular) frame deep is heavy as is, without any bees in it at all. But all I had was deeps with bees on them, so I had to build a deep to use for transition. The bottom is a purpose built box, bottom attached, 1.5" hole entrance. Eventually it will probably have a disc entrance on it for skunks. The top is a Michael Bush style top, just a piece of plywood (though thicker than he uses) with two shims to elevate one end. Just for fun, it has a bevelled edge on the front, maybe to keep rain and snow out. I don't know, I didn't design it that way. I just happen to have a piece of plywood left over from building my chicken coop and it had an angle on it. 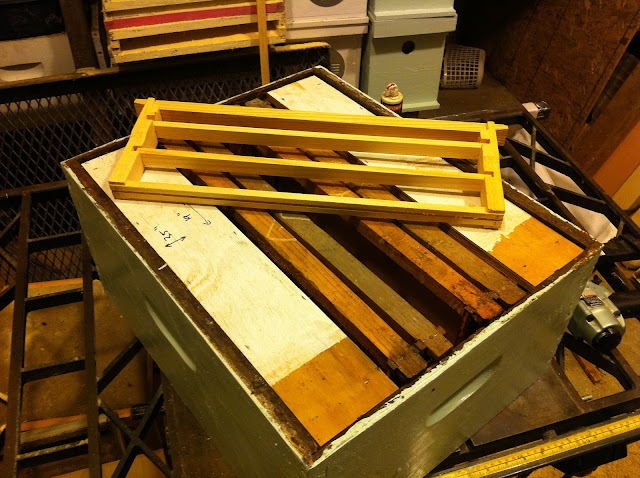 I have two hives made up, two purpose built bottoms, two lids, 6 supers, 1 deep. The purpose in my mind for this project is to see if placing successive boxes with frames at right angles to each other will have any effect. I'm also wondering if square boxes will have any effect on cluster size. A side benefit is that for the same comb area, using boxes with extra frames results in significantly shorter hives. Here's the entrance. In it, you can see the bottom end of the PF-120 frames. They have been trimmed to 1.25" end bars. I put the older queen of the double queen hive from the previous post in this hive. If I had to guess, I'd say they are eagerly intending to supersede her again as a number of supersedure cells were under construction. I should keep an eye on this hive to hopefully be able to divide those queen cells up for new hives.